Photo 110. The Battleship Gneisenau. 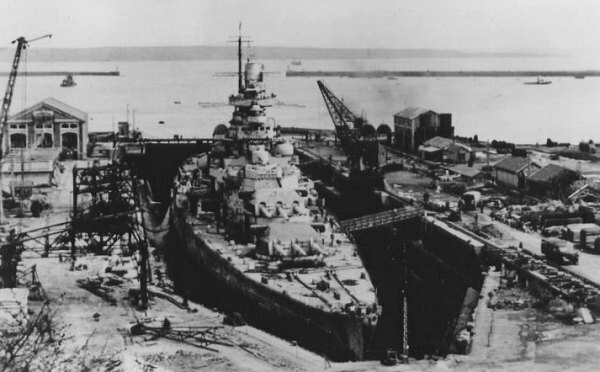 The battleship Gneisenau in dry dock at Brest. On 6 April 1941, a Coastal Command Beaufort plane (Lieutenant Kenneth Campbell) of the 22º Squadron scored a torpedo hit on Gneisenau's stern. The British aircraft was shot down by the anti-aircraft batteries, but the ship was damaged and had to enter dry dock for repairs. Just a few days later, during the night of 10/11 April, the Gneisenau was hit again. This time by four bombs dropped by the RAF, and this forced to lengthen the repair work for months during 1941.